“Designed by Raymond Stegeman, the Wayfarer design made its first appearance in 1952. Since he had procured dozens of patents for Bausch and Lomb, who is the parent company of Ray Ban, the Wayfarer designer glasses was released as Ray Ban Wayfarer. Though Wayfarers enjoyed undisputed leadership in the 1950s and 1960s, sales slowly started to decline for these designer glasses. By the end of 1981, they were on the verge of discontinuation. Ray Ban came up with a brilliant marketing ploy to reverse the fate of the Wayfarers. In 1982, they signed a $50,000 - a - year deal with Unique Product Placement of Burbank, California to place Ray-Bans in movies and television shows. Tom Cruise wore a Wayfarer in the 1983 movie Risky Business and 360,000 pairs were sold in that single year. The designer glasses also gained popularity among musicians notably Michael Jackson, Johnny Marr, Elvis Costello, Morrissey and the members of U2. Soon, Ray Ban started offering Wayfarer in more than 40 models, which is a far cry from the 2 models of 1981. The popularity again started to fade away in the 1990s and in 2001, the Wayfarer underwent a significant redesign with its material of construction being changed from acetate to a lighter injected plastic. Excerpt by Subhadip Sural, one of the marketing executives for EyeExperts.co.uk, an online provider of prescription glasses, designer frames and varifocal glasses. My first memories of the Ray-Ban Wayfarer shades were from the early-mid 90’s when I recall my uncle owning what seem like countless pairs of preferably the black or tortoise color frames. Since my earliest memories of the Ray-Ban 2140 “Original Wayfarer” shades (Exhibit B)* they have recently made a re-emergence into pop culture thanks to the likes of Kanye West, Lil’ Wayne, and other music and Hollywood celebrities. However, the thing about me is that I tend to steer clear from trends or fads in attempts to create my own trail. But if for whatever reason I am strangely attracted to the trend then I will find a way to reinvent and execute it in a manner that it is not being done. So I began to wonder how I could showcase the Wayfarers in a way that I have yet to see. 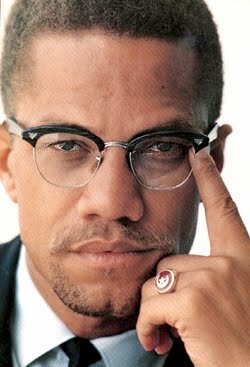 Then I remembered a famous picture of Malcolm X sporting the Ray-Ban 5154 Clubmaster Wayfarers with his NOI ring as his index finger, and the rest of his semi closed left hand, slightly pressed alongside the outer corner of his eye and face with a wanderlust stare at the camera (Exhibit A)*. It had occurred to me that I could sport the Clubmaster “By any Means Necessary” Wayfarer look! Naturally, I decided to make the Clubmaster Wayfarers the “Next Wave” at the beginning of the 2010 Summer season. However, as the Summer approaches its end, I have grown to appreciate this classic look so much that I believe it to have no specific season or expiration date. Therefore, I plan to extend this “Next Wave” into the 2010 Fall season and to my all my fellow E.F.s to try. Enjoy and do not miss the “Next Wave”…. Cowabunga! *Comparing the two frames side by side one can see the difference between the 2140 Wayfarers (B) and the 5154 Clubmaster Wayfarers (A). The 2140 are thicker all throughout the frame whereas the 5154 are much thinner frames, especially at the bottom half of the lenses which only happens to be a wire to keep the lenses in-framed.